Chelsea used to absolutely dominate Tottenham back in the day, with something along the lines of 30+ games in succession going from Chelsea. However ever since 2005 Chelsea has had a hard time at White Hart Lane, as the Spurs have not loss to the Blues in the last 6 games there. This game is a little different, however, since Tottenham have looked strong with their new addition to their team and Chelsea are still unbeaten in the EPL before the game. So which one of the two trends would give way? Game of the Week. EASY. A strong showing from both teams lately made this game an interesting one. However, one thing to note is that Gareth Bale was not in the starting line as reports say that his wife went into labor roughly an hour before the start of the game. Start of with some great play from Chelsea. Torres seemed to be working his magic up front as the three behind him (Mata, Oscar, Hazard) worked well to support. Obi Mikel controlled the game well and worked the team up at a good pace. 17′ minutes in Chelsea’s corner gets deflected out to Gary Cahill, who volleys a smasher right through Friedel. Not much else to report of the half other than a couple opportunities from Chelsea and something or two out of Tottenham. Mainly, Chelsea maintained control of the half and did not let the home team gain any momentum whatsoever. Going to the second half, a early set piece from Tottenham took a confused Chelsea to the tie. However, it didn’t end there as a pressing home team took the momentum of the goal to work a second one from Defoe, who was assisted by Aaron Lennon. A rapid succession of goals plus the home field advantage game Tottenham a commanding lead in the momentum, as Chelsea couldn’t come out of the back in an orderly fashion. After a long spell of pressure from Spurs was ended by a chance from Chelsea, followed by a goal from Juan Mata off a mistake from Gallas. It did not end there as absolutely amazing movement from Juan Mata tied to an amazing pass from Eden Hazard connected for the third goal for Chelsea. After that, the game seemed to go all in Chelsea’s favor as the spell of Tottenham’s momentum came to a screeching halt. More pressure from Chelsea ended up with an extra goal from the substitute Daniel Sturridge, courtesy of the trip from Kyle Walker near the 18 yard box and an assist from Juan Mata. That would basically conclude the match, as the White Hart Lane would suffer its first Blues lose since 2005. Man of the Match- Obviously Juan Mata. Admittedly a quiet man in the first half, but came to life after the Tottenham momentum surge in the first 20 minutes of the second half. After which Juan Mata dictated the pace of the whole game and scored a double of his own, raising his streak to six goals in five games. Second goal, however, blew my mind, as the vision of Juan Mata to make that run so much earlier than it was seen by defenders is truly the reason why he is one of the best in the EPL at the moment. This man is having no thoughts about a sophomore slump. Chelsea’s first true test had arrived, and it looked as though that Chelsea might be up for the task this year. The addition of Eden Hazard was never more prominent then it was today, as the absence of Frank Lampard showed that Hazard was able to take control as the main man when Frank isn’t. Him, along with the seemingly re-budding Fernando Torres, were able to acquire both goals together to give Chelsea the dream start it needed. However, this was no walk, as Newcastle able to fend off Chelsea for most of the second half and attempt some attacking, while the opposite was true in the first. However, other than the shot from Demba Ba off a weird scramble in the box, Newcastle were never too deadly in the attacking end, as Cisse was uncharacteristically quiet. First half, I was incredibly impressed by the Blues. At the beginning of the game, the lineup shook me quite a bit, as Chelsea did not fair well against Newcastle last year, even if losing that game is the reason why Di Matteo decided to put all chips into the trophies. However, everybody’s favorite Blue Eden Hazard stepped up today. He was clearly the main to dictate the pace, as his ability to find the correct pass and to hold the ball under most circumstances showed that he deserved to be on the first team. In the beginning of the game, Hazard was sitting a little too far back, leaving Torres all alone up front. Realizing this, Hazard and Mata brought the game to Torres. After that, the opportunities started rolling in, and Chelsea put two away before the half ended. Newcastle did little but pass and defend for most of that half. However, the second half did not have the same effect. A slow start and little connection between the Chelsea players’ game allowed Newcastle to gain some possession and attack as much as they can. Cisse and Ba both moved well, but even with the majority of the possession in the second half they were not able to find the back of the net. The deadliest opportunity for Newcastle came late in the game, as a whiff and a shot amount passed Cech in the mist of the scramble. Cech’s quick reflexes kept a clean sheet, and the Chelsea defense regained their footing midway through the second half and only built momentum from there. The build was slow, but some great looks from youngsters Ryan Bertrand and Eden Hazard made Newcastle’s defense take note. This momentum would take us to the end of the game. A semi-comfortable game for Chelsea put them on the top of the board, giving the other big teams something to strive for. Being a Chelsea fan, it’s going to be hard talking about my fixtures. I am a huge fan but also a huge critic, and I will be the first to see my teams faults. Regardless, Chelsea did not get handed the win today, but it did seem that the game was decided in six minutes. After that, Chelsea was never too close except for the clearance from Ramis after Torres barely beat the keeper and an attempt from Oscar early after his entrance. 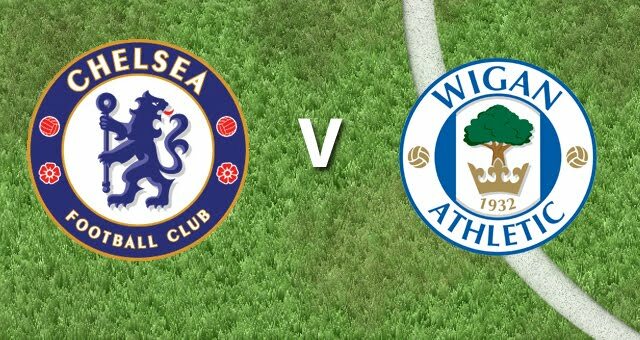 Wigan never looked that threatening, but Victor Moses did give Ashley Cole some issues in the first half. The main note, for Chelsea fans anyway, is that both signings, Oscar and Eden Hazard, has very impressive games today. Hazard started and assisted Bran’s goal in the second minute with a beautiful turn in the midfield, and was also the cause of the penalty due to his speed around the defender. Oscar would replace him in the second half, with a great show of talent and pace. He is a hard worker and is always working off the ball, as well as getting back to play defense, whether it is in the midfield or the defensive third of Chelsea. As for Wigan, I feel like Victor Moses does not have the midfield backing to make him a major threat. I don’t say that because Chelsea is linked with him, but it is something that Wigan is seriously lacking. The team’s defensive line is solid at times, making sure that the mistimed runs of Torres would result in a flag in the air, but otherwise did not seem like they had an answer for Chelsea counterattacks. Chelsea looks good, but this is not the team that will beat Newcastle United next Saturday. Reading shouldn’t be a problem, but Di Matteo is good at prioritizing and taking the season one step at a time. In my honest opinion, I think that Chelsea is a major top four contender and will be consider one of the most volatile teams all season.